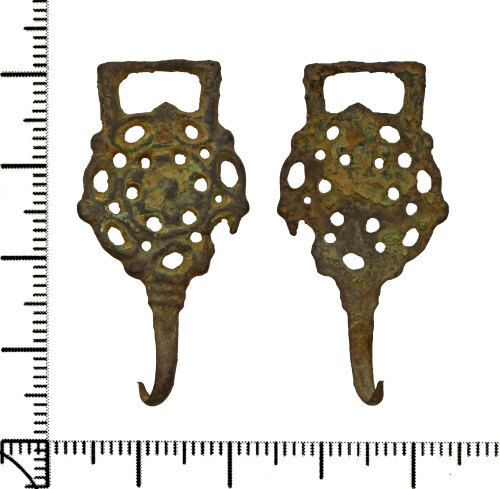 A copper alloy dress hook or fastener dating to the 16th century. The object consists of one piece of copper alloy with a curved rectangular in section hook placed vertically at the lower edge. At the upper edge of the dress fastener there is an inverted-trapezoidal lobe with a central knop at the upper edge of the main body. The body of the fastener is broadly circular in shape. The integral hook would have once attached to another fastener on a garment. The end of the hook is pointed. The decoration consists of a central pellet surrounded by a circular moulded impression, within this are six broadly circular perforations. Encircling this is a moulded relief and openwork design of thirteen oval and circular perforations spaced symetrically. The outside edge is moulded with three knops spaced equally along either side of the main body. The hook is separated from the main body by a transverse collar of two moulded grooves. The reverse of the object is flat and undecorated. The object has a dark-brown to green coloured patina across all surfaces. Reference: Read (2008) illustrates a dress hook on page 103, No.395, which is dated to the 16th century.